A new Sentinel for Blue Wave appears, that also supports sneak attacks. AUTO: [Choose 1 card from your hand, discard it] When this Unit is placed on (GC) from the hand, you can pay the cpost. If you pay it, choose 1 of your “Blue Wave” Units, during that battle, it cannot be hit. ACT (Drop Zone) Generation Break 1: [Bind this card face-up] Choose 1 of your “Blue Wave” Rear-guards, during that turn, “CONT (RC): This Unit can attack from the back row.”. For Today’s Card, we’re introducing a card from the 13th Booster Pack “Ultimate Stride” (on sale Friday November 17th, 2017): The 《Aqua Force》 【Sentinel】, “Blue Wave Shield General, Jorgos”. “Blue Wave Shield General” is a “Blue Wave” exclusive 【Sentinel】, meaning it has the standard Perfect Guard Skill, i.e. but it’s limited to granting “Blue Wave” Units an “Attack cannot Hit”. Also, it can Bind itself from the Drop Zone, it grants your “Blue Wave” Rear-guard the ability to “Attack from the Back Row”. 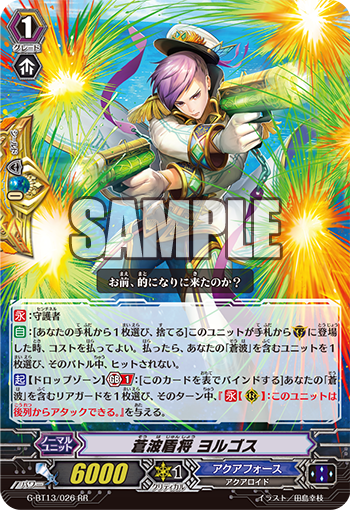 For example, if you combine this card with the Stride Skill of “Blue Wave Marshal Valeos”, you can fix a card’s Power to 11000, while also increasing the number of attacks you can pull off, placing enormous pressure on the opponent. Also, since it has “Blue Wave” in its name, it works quite well with all sorts of “Blue Wave” Support Cards. This 【Sentinel】 is sure to make “Blue Wave” Decks even stronger!